**11/09/2014 - Please see my updated recipe here! I'd had Pecan Pie before, but couldn't really remember the taste - so I jumped at the chance to try my own pecan creation. It was worth it. 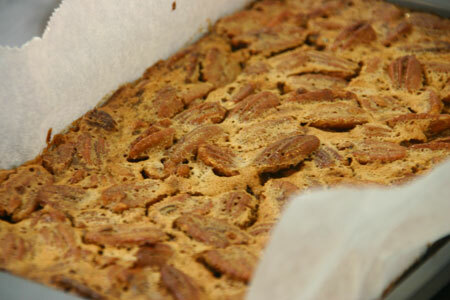 This Pecan Slice is crunchy, gooey, nutty and downright fantastic all at the same time. Recipe Source: I can't for the life of me remember. Though I know it's from someone's blog. 2. 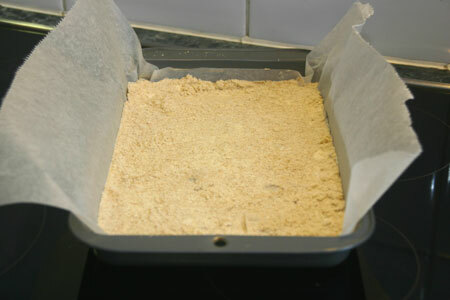 Line a baking tin with baking paper and butter the uncovered sides. I used a 27cm x 17.5 cm tin. 3. 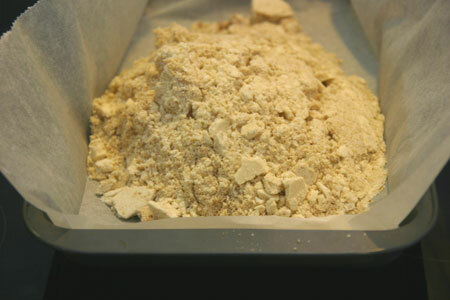 Crust - place flour, brown sugar, butter, salt and baking powder in a food processor and whizz until all combined. Tip the mixture into your lined tin and pat down until flat and even. Bake the crust for 20 - 30 minutes, or until light brown and feels cooked. 4. 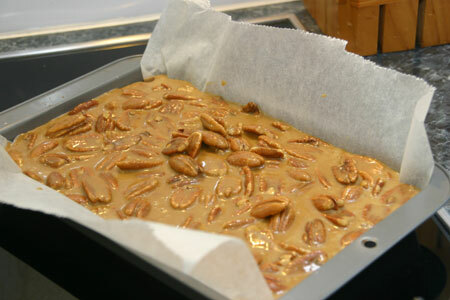 For my Pecan Slice, I used 1 batch of crust and 2 batches of filling. 1 batch of filling just didn't look like enough. This created a slice with about 1/3 crust and 2/3 filling. 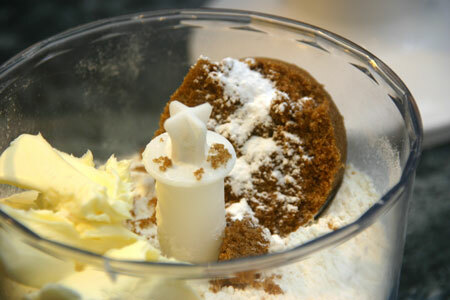 If you want about half-half, use follow the recipe without doubling the filling ingredients. But more gooey caramelly pecan yummy filling, I assure you, is better - if you want this, then double the filling ingredients. While the crust bakes, make the filling (1 or 2 batches, your choice!). Whisk together all ingredients except the eggs and pecans in a medium bowl until just combined. 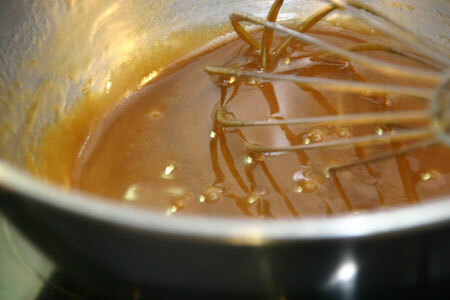 Add egg and whisk until incorporated. Add pecans and mix gently so the pecans are dispersed throughout the mixture. 5. When the crust is done, pour filling on top of it and poke the pecans around so there are pecans everywhere. If there are some cracks in the crust, don't worry too much unless they are gaping caverns. 6. Bake for 30 - 35 minutes, or until the top is brown and cracks start to form across the surface. 7. 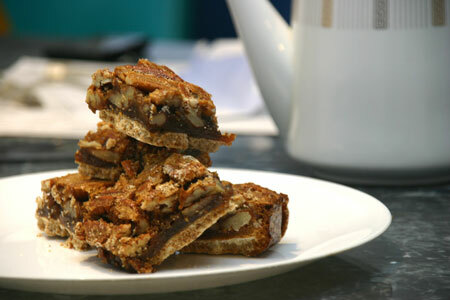 Leave to cool in the tin for a bit, then lift out by the baking paper and cut into slices whatever size you desire. Make sure you try some when it's warm - it's good. 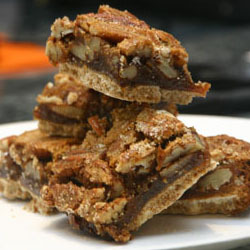 There is nothing I love more than pecan pie...so I was thrilled to find this on Tastespotting! I am now following your blog...its great! Peanut Butter and chocolate - in a biscuit.